Last night, I got my Exalted Champion of Darnassus title and luckily, for the fifth and final faction (Exodar - just because it's last in the row of NPCs), I will finish in 4 days. The key here is there are three random daily quests you can get from the factions - A Blade Fit for a Champion, A Worthy Weapon, and The Edge of Winter. Theoretically, you can earn 5 Valiant's Seals a day. However, when you turn in your 25 seals for The Valiant's Charge, you can then immediately pick which faction you are going to champion next. As long as that faction has a different quest of the three random daily quests, you can do it, allowing you to earn 2 extra seals on the day you switch factions. The problem I ran into is that after finishing my first faction (the gnomes, of course!) I didn't get that extra quest, so I've been 2 behind people who got lucky that time. But just 2 seals back doesn't save you a day of quests. Luckily, when switching the next three times, I got the extra quest, so I'm 6 seals up right now and will be able to complete the last leg in just 4 days! So even if people got lucky each time they switched, they will be on the same timetable as me. All I know right now though is that I'm going to be up early Saturday morning to get my Exalted Argent Champion of the Alliance achievement and become...Crusader Tiddlywinks! Also, this weekend, a grouping of the Gold Team and Group 2 went into 25 man Vault of Archavon and took down Emalon with ease. Unfortunately, no T8.5 for mages, but we had just one wipe due to a priest mistake within the first 15 seconds of the fight. We regrouped and essentially one-shot him. 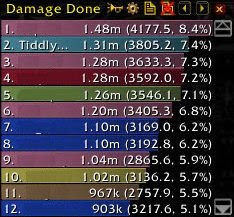 In that Emalon fight, I was quite happy with my DPS. I've been experimenting with arcane and just haven't been able to figure out how to sustain high DPS with it. I ran arcane through the first half of our 25 man Naxx run last weekend and it just wasn't doing the damage I expected. I was using the right rotation and though it was tough to time my evocations properly, I did have minimal down time to regen mana. Yet each fight, my DPS seemed to be lower than what I could have gotten with Frostfire Bolt. So I'm back to Frostfire Bolt because A) I think it does more DPS and B) I know the spec and rotations and know how to maximize my DPS with the spec. So here's where I ended on the Emalon fight. Geeez.. you are chewing through those Argent titles!